Upon entering the theatre, the audience is immediately steeped into a world of endless white. When the music begins, it builds a tension that does not let go until the curtains fall. Similarly, the convincing performers held me trapped in the plot for the whole 2 hours and 20 minutes. This was an opera that seized my attention and never let it go, as it pulled me into a world of ice in which technology and logic clashed with magic and superstition, a place where individual egos and desires were confronted with the necessity of community. The performers truly stood out, as their high-energy acting and singing was consistent throughout the evening, thereby maintaining the tense atmosphere upon which the plot relied. The cast’s cohesion was particularly important, as each performer reacted to and engaged with the others’ actions, thereby making the plot come alive. In particular Jennifer France in the role of Ice, a woman resurrected from a block of ice and symbolising the ‘scientifically impossible’, was stunning. The reach of her voice, and the use of body language convinced me of her pivotal role in the plot, without which the opera would have seemed ridiculous. The plot itself was thought-provoking and decidedly modern. 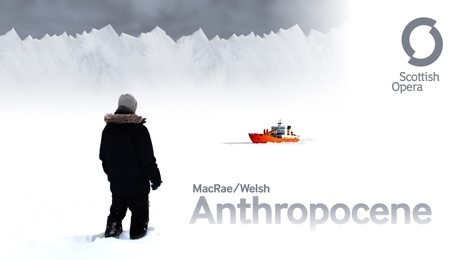 The ship, King’s Anthropocene, is in the Arctic North looking for samples released due to the melting of the poles. References to current affairs like allegations of Russian interference in elections, or the individual’s responsibility for global warming, drew the story-line into the present. Yet the underlying themes are timeless and call for reflection: greed, prestige, logic vs. superstition, the individual vs. the bigger picture. This play felt modern, in both content and form, verging on the cinematic. This made it both relevant and captivating as all elements came together in the final act. Especially the gripping music and scenery created a desperate and tense atmosphere that descended into chaos and discord in the final act.